The 3DS version of Nintendo's StarFox 64 will feature its classic multiplayer mode, but you can't play it online. Nintendo introduced the 3DS as a system that would embrace online functionality, with features such background Wi-Fi SpotPass game updates and an easier-to-use Friend Code system. Sadly, that embrace is not carrying over to all of Nintendo's first-party titles, as it's been revealed that StarFox 64 3D will not feature online play. StarFox 64 included a four-player multiplayer deathmatch mode where players could kill each other in Arwings, Landmaster tanks, or even on foot in the bodies of StarFox's bazooka-wielding anthropomorphic team members. A recent Japanese retailer briefing has unveiled that this mode will indeed be included in the 3DS's upcoming StarFox 64 3D, but with online play sadly excluded. If players want to do a barrel roll to avoid each others' attacks in StarFox 64 3D, they'll have to be in the same room. It's disappointing, considering that online play has been heralded in 3DS games like Super Street Fighter IV: 3D Edition, and even featured in regular DS games like 2006's Metroid Prime Hunters. Not to be overly critical, but I hope this isn't a signal of future online support in Nintendo titles such as Mario Kart 3DS, and it very well may not be considering StarFox 64 3D's nature as a remake and a primarily single-player game. Thankfully, the game's multiplayer mode will support download play, allowing those that don't own the game to get in on the action. StarFox 64 3D will also take pictures of players' faces and display them for easy recognition. 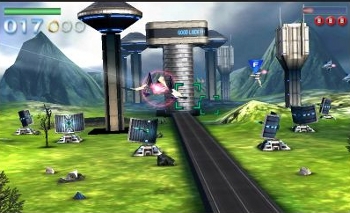 In addition, the briefing revealed that StarFox 64 3D features both "3DS" and "64" modes, presumably meaning the original game will be present without graphical updates (and other changes), and that players will be able to use the 3DS's gyroscope to tilt the system as a control method. Just tilt forward to use the boost to get through.